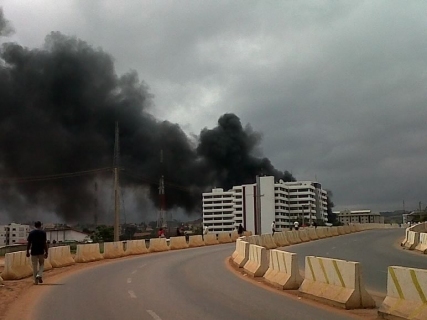 Reports from Abuja say there has been a bomb blast at the Nigerian Police Headquarters, Abuja. Eye witnesses say they heard a loud explosion, shaking of nearby buildings and smoke bellowing out of the compound. Initial reports suggest that this might have been a car bomb as Aljazeerah reports that the explosion took place at the police headquarters’ car park. It is yet to be confirmed what terrorist/militant organization is responsible for this act of terror. There have been several bomb explosions in northern Nigeria before, during and after Nigeria’s general elections earlier this year. These were mostly claimed by Boko Haram a militant organization which advocates the implementation of strict Sharia (Islamic) law in northern Nigeria whilst denouncing western education and institutions as being forbidden under its interpretation of Islam. Also the Movement for the Emancipation of the Niger Delta (MEND) had claimed responsibility for the bombing that took place in October 1, 2010 during Nigeria’s 50th anniversary celebrations with several people killed or injured. Some political observers see this escalation of violence in Africa’s most nation has a challenge to the country’s leadership with a large part of the population living in poverty and seeing little impact of billions of dollars in oil revenue that Nigeria generates every year. Increasing numbers of youths in particular are looking to crime, militancy or terrorism as ways of surviving and making their own political statements.